Ah, the joy of an impulse buy with a high interest rate credit card. I wasn't really interested in the MacBook Air until I started reading about it more and more last week. 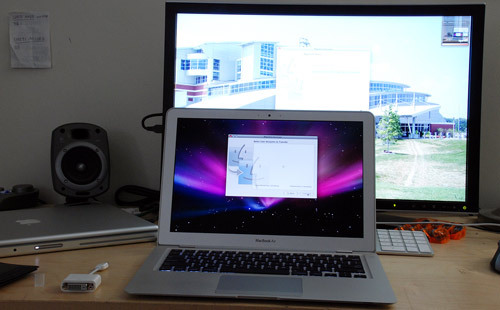 Then I realized I lug my MacBook Pro around everywhere and I naturally just had to get the MacBook Air. The title is a bit misleading but it draws upon the minimum monthly payment on my credit card: 15. Of course I won't be paying 15 per month forever, but it makes for a nice title. MacBook Air Unboxing from Paul on Vimeo. I chose the lower MacBook Air model: 1.6GHz Core 2 Duo with 80GB hard drive. I did a lot of research about which to buy and while I was financially limited, I knew the SSD offered by Apple is slow compared to other SSDs and is overpriced. The 1.8-inch SSD offered by Apple as a 999 option has paltry read rates (~50MB/sec) compared to other SSDs currently out that can consistently put out read rates over 100MB/sec. As for 1.6GHz versus 1.8GHz, the upgrade is about a 15% price hike for a 15% increase in clock cycles. It's not that noticeable and when a better MacBook Air comes out down the line, you'll be glad you didn't pay the higher price for an outdated machine. The last thing I did before heading to the Apple store was ask Ryan if the Air can play HD content. He told me it can for the most part, albeit 1080p video stutters/drops frames at times. That's fine by me, I won't be playing full-HD video too often. MacBook Air along with a notebook in my messenger bag. I took some notes and made a list of the first things I did with the MacBook Air. I chose not to use the migration assistant as I felt I would be better off with a clean install instead of bringing over all the junk from my MacBook Pro. That and the Apple store was out of the coveted 29 etherdongles, so there was no way I was going to spend a year transferring everything over Wi-Fi. I have a newfound love for the notebook view when taking notes in Word 2008. Setup Mail.app with my @gatech.edu mail address and configured LDAP for directory auto-completion. Copied over ~/.ssh/ from MBP for public keys, known hosts and so on. Copied over Music, Pictures and Documents folders (totaling ~20GB) from MBP via external hard drive. Changed iTunes icon. I normally don't care about icons and "beautifying" the OS by changing everything but I don't care much for the standard blue iTunes icon. The MacBook Air is now my primary and only machine. I migrated all my data over from the MacBook Pro and will be in the process of selling it after I take it in for some repairs. I've only had the Air for 24 hours so I'll write a post after this detailing my experiences with the Air as my primary computer. So far it's great and the slower speed hasn't affected any of the things I do. It just tends to have the fan bumped up more often than not, such as when running my 24-inch display. Thoughts? To Air or not?